During the day-long celebration, fourteen kitties found forever homes, and another one found foster parents—thanks to the Queens-based no kill animal rescue organization, For Animals. New owners took an oath to uphold the values of Kitty City (administered by Kitty Citizen, Moira Williams during an hourly ceremony), in which they raised their paws, blinked their eyes, and rubbed noses with their new family member while reading the manifesto. Visitors were also able to learn about improving the quality of life for free-roaming cats from Neighborhood Cats, who provided information about the Trap-Neuter-Return method. Interested in Kitty City Memorabilia? 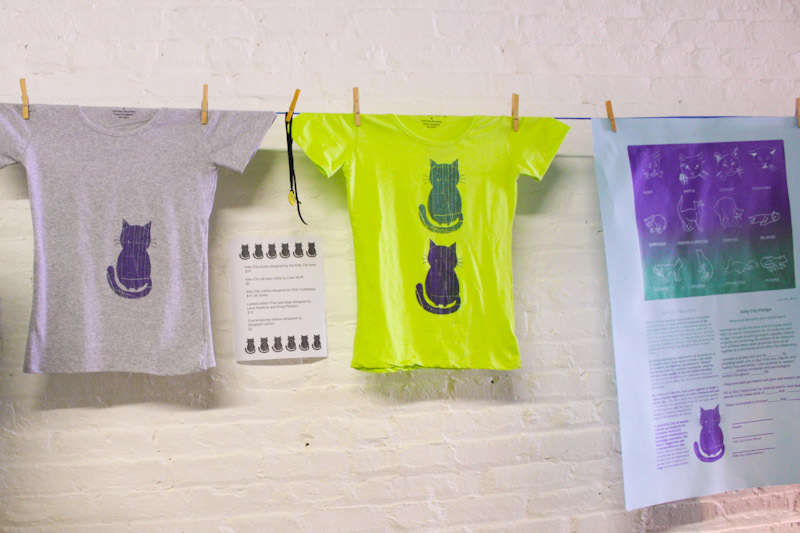 If you missed your chance to get a one-of-a-kind t-shirt (pictured below), embellished with opalescent green and purple cats and the Flux Factory logo, you can place your order for a limited time right here! Each one is unique and silk screened on Flux Factory premises; sizes come in kid’s S, M, L and unisex adult S, M, L (please indicate your size). Everyone who adopted a cat went home with a silk screened poster bearing drawings of cat’s emotions, the Kitty City oath, and manifesto. You can order yours here, even if you didn’t adopt a cat! You can also purchase a collar/pendant, by artist Leah Wolf as part of the Kitty City oath and adoption pledge ceremony. 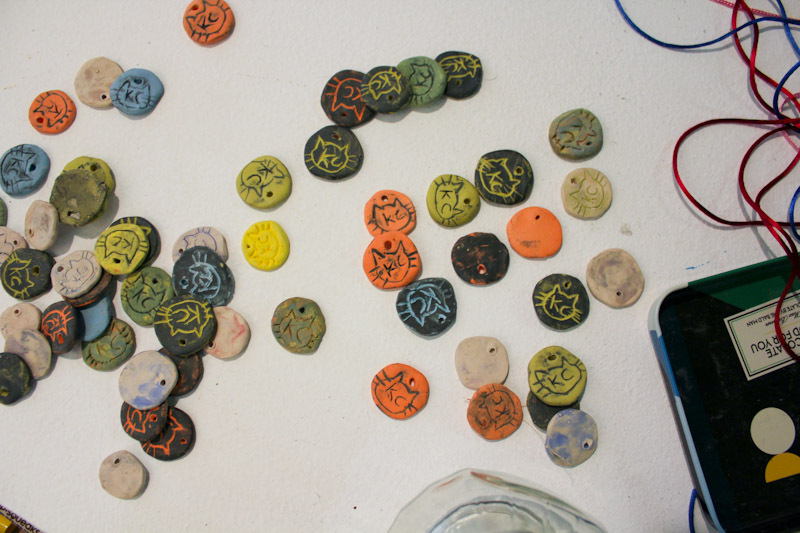 Made from dyed porcelain, each one bears the Kitty City logo, and is great for hanging on a necklace, bracelet or a collar. *Please note: t-shirts are a limited-time offer and all orders must be picked up at Flux. We’ll email you with pick up times. There’s nothing the internet loves more than kittens, except maybe kids playing with kittens. Kitty City was widely covered in art, urban discovery, and parenting blogs, and even a social network for felines, describing it as “the place to be” and “the perfect urban environment for cats.” Like any thriving metropolis, Kitty City even had its own newspaper, Kitty City Daily, which announced the major events of the day and offered advice from a cat’s perspective. An article in New York Observer. In Time Out NY, as a Critic’s Pic, a slideshow, and another slideshow. In Gothamist, as a preview and slideshow. An article and series of videos from the Queens Courier. A blog post by our neighbors, Materials for the Arts. Thorough investigations of the metropolis in Catser, Untapped Cities, Crass Talk, and Makezine.